Danvers: Props from a "Toy Story" themed float sit on the sidewalk, waiting to be collected, as parade participants walk to the awards ceremony in Plains Park after the end of the Danvers Recreation Summer Playground Program Playground Parade. Photo by Mary Catherine Adams/Salem News. 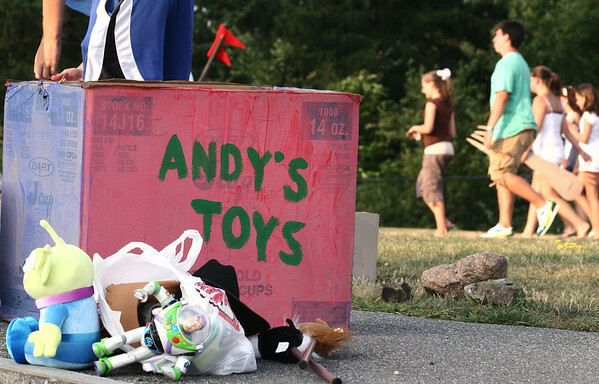 , Danvers: Props from a "Toy Story" themed float sit on the sidewalk, waiting to be collected, as parade participants walk to the awards ceremony in Plains Park after the end of the Danvers Recreation Summer Playground Program Playground Parade. Photo by Mary Catherine Adams/Salem News.